It has been a year and a half since I last wrote about golf, in a post titled "Golf-22," from March 2009. At that time, I had high hopes for getting my golf game back on track well enough to actually enjoy it again, a feeling I had not experienced in more than thirty-five years, since I was fifteen and shooting in the low eighties. What has prompted me to write about golf again is a book my wife Nan found for me, The Downhill Lie: A Hacker's Return to a Ruinous Sport by Carl Hiassen. Like me, Carl started playing golf again after a lengthy hiatus, to disastrous effect. Sharing in Carl's frustration, knowing that I am not alone, has given me the courage to continue the story of my golf game from where I last left off. After the men's club opener at Redlands Mesa Golf Club in March 2009, which my foursome won by several strokes, I was pretty excited about the game. I used my prize money to buy a Cleveland Golf lob wedge, a club I had needed for years but never owned. I adjusted my work schedule so that I could play eighteen holes every Wednesday afternoon with other men's club members, and I went to the driving range and putting green every chance I could get. Instead of improving from all that play and practice, my game gradually fell apart. An errant shot would land me in trouble, and I would waste endless shots trying to get out of it. Double-digit scores on single holes were not out of the question. But like most bad golfers, there were also occasional flashes of brilliance--a birdie here, a chip-in there--that helped keep hope alive. After a not utterly terrible men's club round, my golf buddy Tom asked if I was going to enter the Redlands Mesa Open, the club's annual May tournament. I'm sure my look said, "Are you out of your mind?!" He smiled and said, "I was just thinking that with your high handicap, you might be able to play a couple of break-through rounds that would put you in the running for the low net championship." I gave it some thought over the next few days and asked another men's club golf buddy, AJ, who played at about my level, if he wanted to join me. He wisely opted out. On the first day of the tournament, I arrived more than an hour before my scheduled tee time to work out the kinks at the driving range. I don't know if it was nerves or just another stage in the natural disintegration of my game, but I sprayed shots all over the place. If I hadn't already paid the entrance fee, I would have just gone home. Instead, I went up to the clubhouse to meet my two playing partners, an older guy who worked at the golf course and a younger guy who was only playing with us high-handicappers because he had needed to attend his wife's college graduation ceremony earlier in the day. As the last group to tee off, at least we didn't have anybody putting pressure on us from behind. Not that it mattered to me, I triple-bogeyed the opening hole. The round proceeded in about that same vein or worse. I'm sure my playing partners were wondering what I was even doing out there, but they were nice enough not to laugh, though I gave them plenty of opportunities. Within a few holes, my nervousness had given way to a slow-boiling anger and I was swearing fluently after every bad shot. By the time we reached the fourteenth hole, I was ready to explode. The tee shot on number fourteen must go between two giant boulders on either side of the fairway in order to set up a short pitch to the green, which is hidden around the corner from the boulder on the right, making for a ninety-degree dogleg. My drive was short. I could either try a blind shot over the boulder to the green or lay up for an easier shot. The pin was at the front of the green so I opted for the lay-up. My next shot needed to land on the fringe at the front of the green and roll close to the pin. Instead, it went under the lip of the sand trap that protects the front of the green. I opened my sand wedge's clubface as much as possible and took a vicious swing, hoping to pop the ball straight up and onto the green. The ball hit the lip and dropped even closer to it. I tried again. And again. All I managed to do was dig a deeper hole. I turned to my playing partners and asked what my options were. They just stared at me like I was crazy, and at that moment, I did go a little bit crazy. I took a stance ninety degrees to my right and hit the ball out of bounds with all my might. I turned toward where the golf carts were parked and two-hand overhead tomahawked my sand wedge as hard as I could in their direction. I stepped out of the trap and did the same with my putter, which I had foolishly carried with me, thinking I would be finishing the hole. I picked up the rake and dragged it through the wreckage in the sand trap, then walked back to the carts without making eye contact with my playing partners. I took my seat in the cart, picked up the scoring pencil, and marked a large "X" on my scorecard. Disqualified. I finished the round in silence, uselessly parring the final hole. When we got back to the clubhouse, I handed my scorecard to one of my playing partners, took my clubs off the cart, and went home. Even though she could see it on my face, Nan still asked, "So how did it go?" All I could think to say in return was, "Worst round of my life." We had planned to go out to dinner at a new rib joint, so we went ahead and did that despite my foul mood. After a couple of glasses of wine, I told her about my day. After several "Oh, my"s, she asked what I was going to do about the next day, the second day of the tournament. I wasn't sure. What if I showed up and they told me I couldn't play because I had been disqualified? I didn't think I could stand the humiliation. I lay awake in bed long into the night thinking about golf and what I should do about it. I finally reached two conclusions: I would not try to play in the second day of the tournament; and I would stop keeping score. Golf is the only sport I participate in regularly that involves keeping score. Scores allow golfers to compare their performance to past performances and to other golfers' performances. If you're good, this is part of the fun. If you're not, it takes all the fun out of it. I enjoy the activity of golf, being outside in a beautiful environment on a sunny day, socializing with friends and getting a little exercise, but keeping score just ruins it for me, so I don't do it anymore. Sure, I know if I've just parred or birdied a hole, but I don't add the holes together to get a final score. I no longer have a handicap, I no longer belong to the men's club, and I will never enter another tournament. And you know what? I enjoy golf much more now. By the way, I found out later that playing partners in a tournament are not allowed to ask for advice. I also found out that it is permissible to take an unplayable lie in a sand trap. Oh, well. Don from the Spring Cove Marina boatyard called me on Thursday to ask what color I wanted for the anti-skid deck paint for Whispering Jesse. I asked what the options were and he explained that sailors used to go with a contrasting color like beige to avoid excessive glare but that the current trend is to go with the same color as the deck. The deck is being painted in Awlgrip's "snow white," so I agreed to go with that same color. It will be awfully bright but hopefully also cooler than beige, which is already going to be the color of the new dodger and bimini--I don't want to overdo it. After the deck is painted, Don said they would be covering the boat and moving it out of the paint shed for a few weeks while they work on a different boat. The next logical step in the refit process is to replace the engine, and that would involve moving the boat back indoors. It will be January, after all. I would like to be there in person when the engine is removed to get an idea of what is involved and to see the transmission and stuffing box. Don said he would be away the first week of the new year, so I told him I would look at heading out there the following week for a few days. 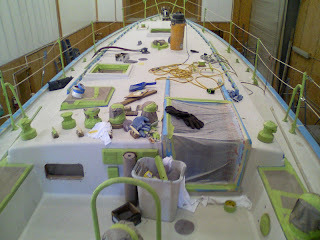 Steve from Creative Canvas Designs was on-site later that same day to take measurements for the new dodger and bimini, and was nice enough to send me the photo above, showing the deck masked and ready for painting. I noticed that the manual windlass and the cable TV/phone hookup box that is located directly to starboard of the cockpit bulkhead's port were still in place. The windlass will be replaced by an electric one and the hookup box is obsolete, so I had asked Don to remove them before the deck is painted. I emailed him a reminder. Another thing I noticed is that the new chainplates are in place now, so that completes the rerigging work, except for restepping the mast, of course, which will take place next spring. During our sailing trip this past spring from Bocas del Toro, Panama to Isla Mujeres, Mexico, the subject of circumnavigating came up, as it always does when Nan and I sail with John Kretschmer. Being in the Caribbean at that moment, we spent most of our time talking about the best ways to sail that particular sea. Several books are devoted to advice about sailing the "Thorny Path" from the east coast of the United States to the Virgin Islands by way of the Bahamas, which is, as the name implies, a relentless bashing to windward. Most recommend avoiding it by staying to the north and sailing as far to the east as possible using the variable winds of those latitudes before turning south into the easterly trade winds and aiming directly for the Virgin Islands. For those with the patience to pick and choose their wind opportunities, there are books that prescribe the path itself, like Bruce Van Sant's Gentleman's Guide to Passages South: The Thornless Path to Windward, which was recommended to me by my friend Paul Caouette but which Amazon tells me is out of print. John Kretschmer is a proponent for sailing the Caribbean islands from south to north, or more accurately, from southeast to northwest, using the trade winds to natural advantage instead of fighting them. He has crossed the Atlantic several times, and this south-to-north route is part of his normal return trip, but what about those wanting to sail directly from the United States? John says the best way is to circumnavigate the Caribbean in a counter-clockwise direction. When he first mentioned this idea, during our sailing trip last year in the Spanish Virgin Islands, I imagined that he meant sailing from Florida to Mexico, following the Central American coast to the south and then the north coast of South America to the east, arriving in Trinidad and then island-hopping back to Florida. During this year's discussions, I discovered how wrong I was. John said that sailing east along the north coast of South America is even more of a thrashing than the Thorny Path. Instead, he recommended sailing east from Mexico's Yucatan peninsula to Cuba's southern coast to stay in the lee of the trade winds and then using the evening land breezes to make progress to the east past Hispaniola and Puerto Rico. One would still need to island-hop to windward from the Virgin Islands down to Trinidad, but then one would be in position to reverse course and enjoy the downwind sail back through the islands, hitting any points of interest missed on the way down. Hang a right at Puerto Rico, and negotiate the Turks and Caicos and the Bahamas to arrive back at the original starting point. This is the route I hope to take beginning next spring, when Whispering Jesse is set to sail. Depending on what we find along the way, it may take a year or more to return home. Then what? As John has suggested, why not get Europe out of the way sooner rather than later?